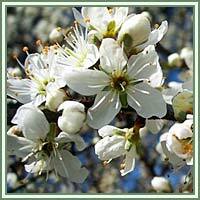 Habitat: Blackthorn is native to Europe, western Asia and northwest Africa. 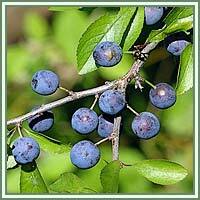 Description: Blackthorn is a deciduous large shrub or a small tree growing up to 5 meters in height. It has rough and scaly, black bark and dense, stiff and branches. Branches bear long, sharp spines. Leaves are small and oval. They are 2 to 5 centimeters long and 1.2 to 2 centimeters broad, dark green in color and have a serrated margin. Flowers are small and delicate, with five oval and creamy-white petals. Flowering occurs in early spring. The fruit is a drupe, thin-fleshed and with a strongly astringent flavor, blue-black or deep purplish in color. Useful components: Tannins, organic acids, sugars and vitamin C.
Medicinal use: Blackthorn is an excellent astringent. It can be used in treatment of diarrhea. Its pectin components have a soothing and relaxing effect on stomach inflammations. An infusion of the plant can be used as a mild laxative in treatment of constipation. Sloe berries can be used for stimulation of our metabolism, and can be of very good use in cases of eczema, herpes, allergies, colds, catarrh, indigestion, kidney stones, and skin and bladder disorders. Steeped in boiling water, the flowers have a mild diuretic, tonic and laxative properties. Used in form of an infusion, flowers can ease menopausal symptoms and help in cases of skin conditions such as acne, pimples and dermatitis. The liquid from the boiled leaves can be helpful as a mouthwash in cases of sore throat, tonsillitis and laryngitis. Safety: Some herbs could react with certain medication. Therefore it is highly advisable to contact your doctor/herbalist before consumption of any herb.